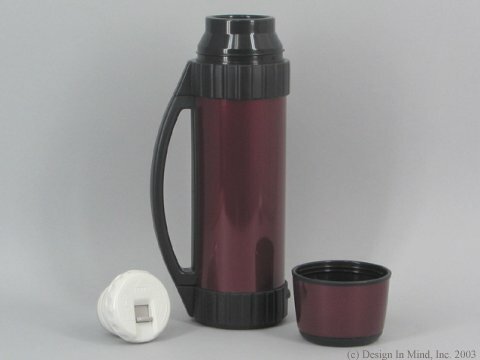 Stainless steel vacuum bottles for hot and cold liquids. A 1 quart all stainless vacuum bottle with push button pour! New TUFF series design is smaller and lighter than many other 1 quart stainless bottles. Unique handle is designed to prevent rolling, even when full! Non-stick interior makes it easy to clean and protects the flavor of your tea! About 11 inches high and 3.25 inches diameter. 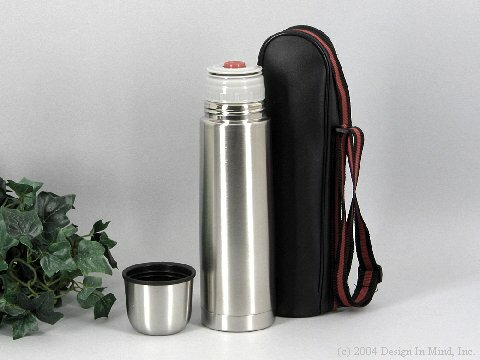 A 16 ounce all stainless vacuum bottle with push button pour, and a double zippered shoulder bag!